There are reports that black turnout is down from 2012 due to a lack of high enthusiasm for Clinton among black voters. This could make a big difference in Pennsylvania. In addition, the transit strike in Philadelphia could also have an impact. Democrats are worried about this. 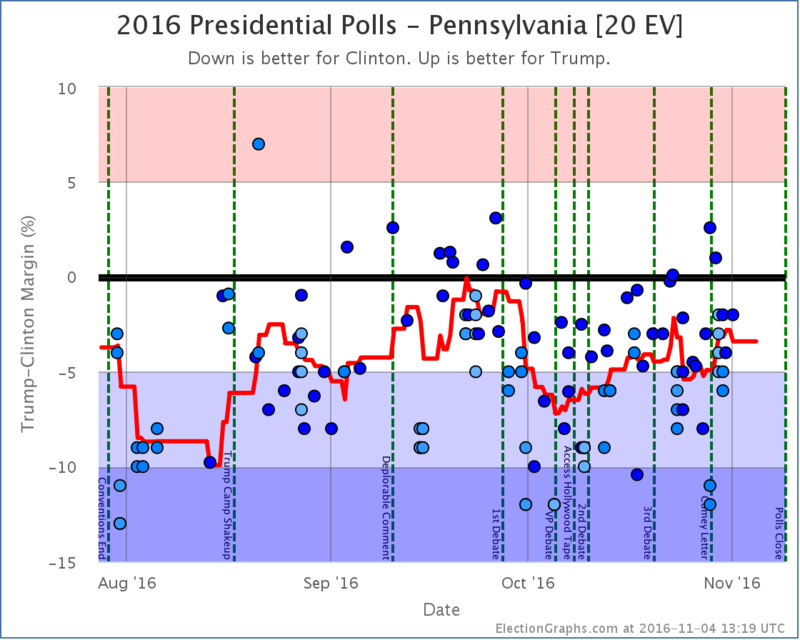 In other words, even if Trump does not win over many undecideds in Pennsylvania, voter turnout could favor him enough to provide a victory. In addition, there have been reports of voter fraud in Pennsylvania which might, after investigation, cancel some Clinton votes. Of course this assumes Trump will contest a close race, which I think is almost a certainty. Truth is there has been only one case of fraud so far anywhere that has led to an arrest. A Trump supporter in Iowa voted twice and got caught. Now I know the USA is not a Democracy per se, but it is at least supposed to be democratic. If an election was run like this in Africa, Asia or South America there would be questions and poll watchers from other countries to oversee the process. The accusations, counter accusations, gerrymandering, disenfranchising and attempts at legal voter suppression have no place in a country that’s supposed to be an example of how to do things properly. 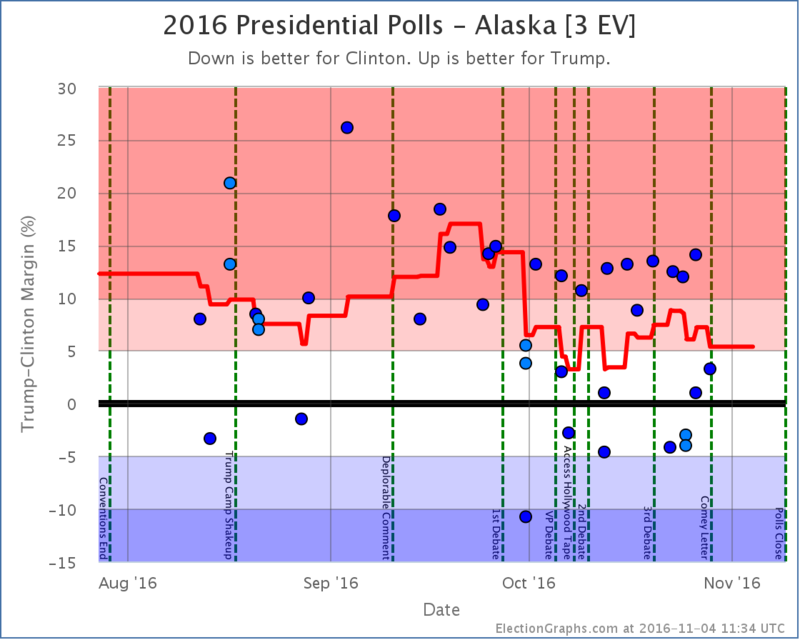 Any thoughts on why campaign internal polling (on both sides as I understand reports) hasn’t shown the same volatile results as public polling? Presumably it’s done the same way, same or similar companies and so on. What would the difference be? Is it something in the LV screen? I can understand a natural tightening of the race (undecided voters historically breaking, on average, 2:1 in favour of the challenger, swings away from third parties etc). 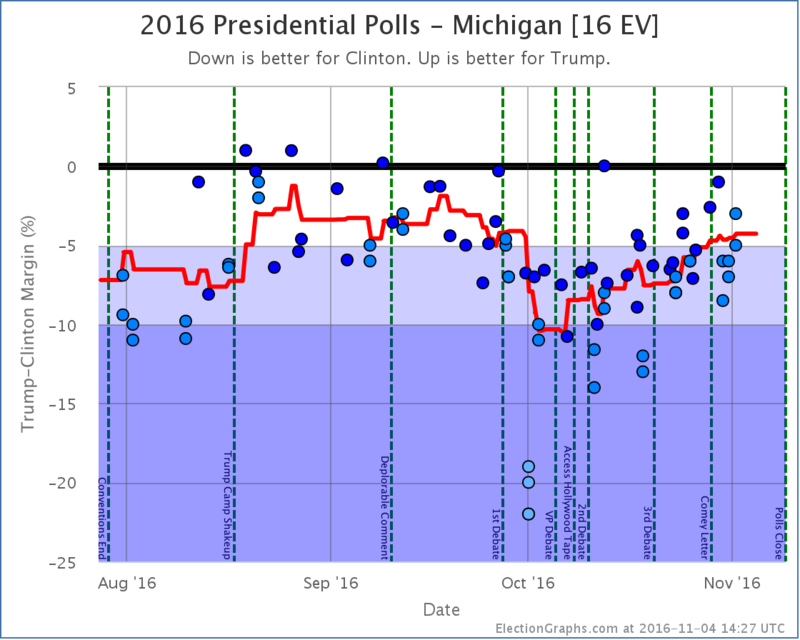 Evidence also suggests that this hasn’t been HRC losing support, but DT gaining some of his soft support back. I think I’m going to stick with my prior prediction, even though it looks less likely. Strong win for Clinton, possibly as high as 400EV, but realistically nearer the 350 or thereabouts mark (330+ certainly). I can see IA or OH flipping, just as I can see NC going the other way. I can also see there being one or two surprises, AK, GA, AZ or UT looking most likely to do that. Anyone else care to make an (equally vague) prediction? 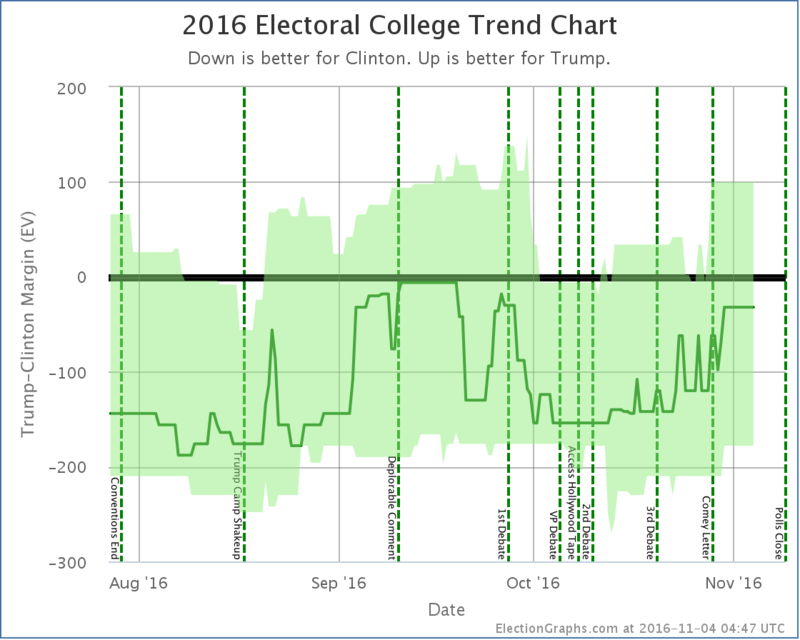 Richard: according to the guy who runs predictwise, a lot of volatility in polls is from “partisan non-participation”. For example, after the Comey letter, Clinton supporters were less likely to want to talk to a pollster. But they are still going to vote for her. Perhaps the internal polls have some way of compensating for that effect? I won’t make any predictions, other than Trump will not concede. I’ve seen similar explanations but it doesn’t make sense to me because they would still be talking to a pollster – be it a campaign, partisan, sponsored poll, tracking poll or university department. But if campaign people can filter for this, then why can’t others? We know that screens are in place for LV, and that tweaks are made for demographic weight (although some overcompensate, like the 19 year old black trump supporter in IL who skews the LA Times poll) and we know all pollsters use their own models that can have inherent bias. 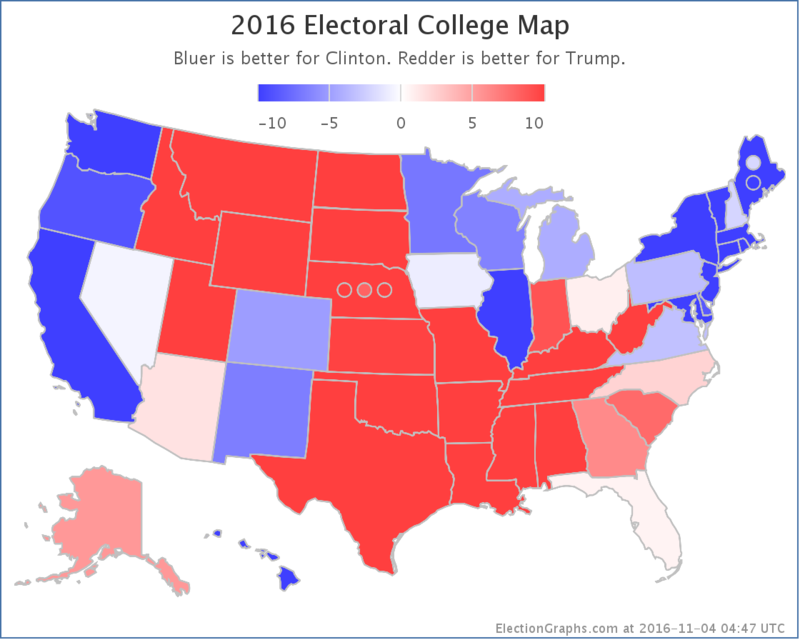 With the exception of extremely partisan pollsters, I was under the impression that campaign polling was generally quite accurate and generally in agreement – enough that states/areas/demographic groups could be targeted, or given up as lost causes and usually in tandem. So how come the average ‘pollsters on the street’ can’t be so accurate? Yeah, I’m not sure how you could accurately correct for partisan non-participation. I mean, you might be able to measure it, if for example, the percentage of Democrats responding to your poll suddenly dropped, but I don’t see how you could compensate for it without making up numbers out of thin air. Perhaps when participation drops abruptly they average in the new data more cautiously? In terms of internal polling, I really don’t know. My assumption is that they spend a lot more money and have constantly running polls with a larger number of interviews, concentrating heavily in the states they think matter. 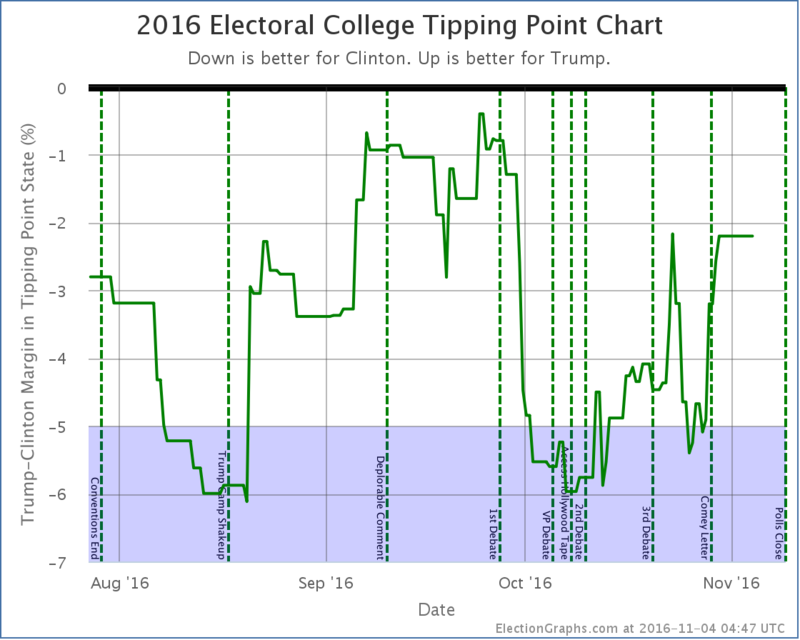 As for my own prediction, obviously I officially have to agree with whatever my model says, but at the moment I think I was really happy with where the model was on Sunday (Clinton 323, Trump 215), while I’m really dubious of the moves in the averages included in the last update. I expect to do an update in the next couple hours that will move Nevada back to blue (I think, peeking ahead at the handful of polls that came out since late last night when I cut off additions for the current update), but my gut tells me that Florida is blue too. 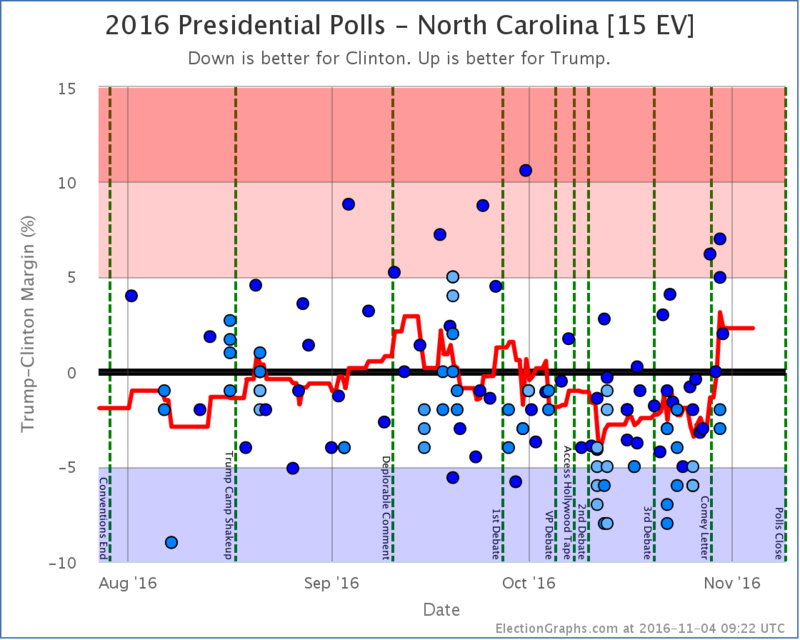 North Carolina more of a tossup I think, but I might bet blue. Unofficially of course. Officially my predictions are wherever my site ends up when I do my last update a little later today. A better explanation (and one I may have read elsewhere) is if it’s voter enthusiasm rather than participation. If a number of supporters of a candidate go from being ‘very likely to vote’ to being ‘somewhat likely’ then they may be cut off by the likely voter screen. If the internal screens are less aggressive with enthusiasm then that might explain some of the lack of volatility. I think I’d agree that all three of those are blue, possibly just, but still blue. A lot may depend on how undecided voters break, apparently there are a historic amount of them (some 12%). 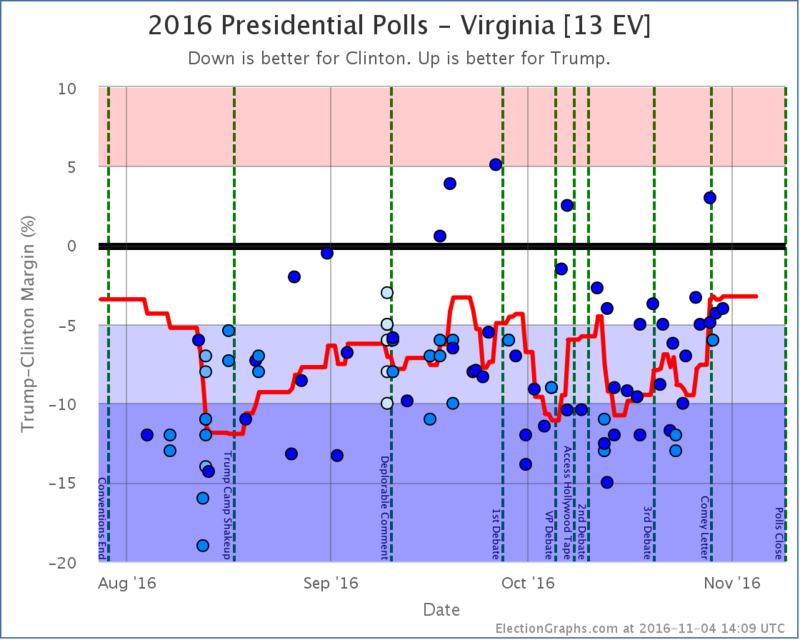 It may give an indication of how the polls are doing for accuracy, assuming it’s accurate itself. Yeah, I have seen that was out there, but haven’t had much time to look at it. Speaking of which, have to get back to identifying and adding the last minute polls… I think I am only missing a handful from an outfit called Insights West, but going through all my sources just in case. 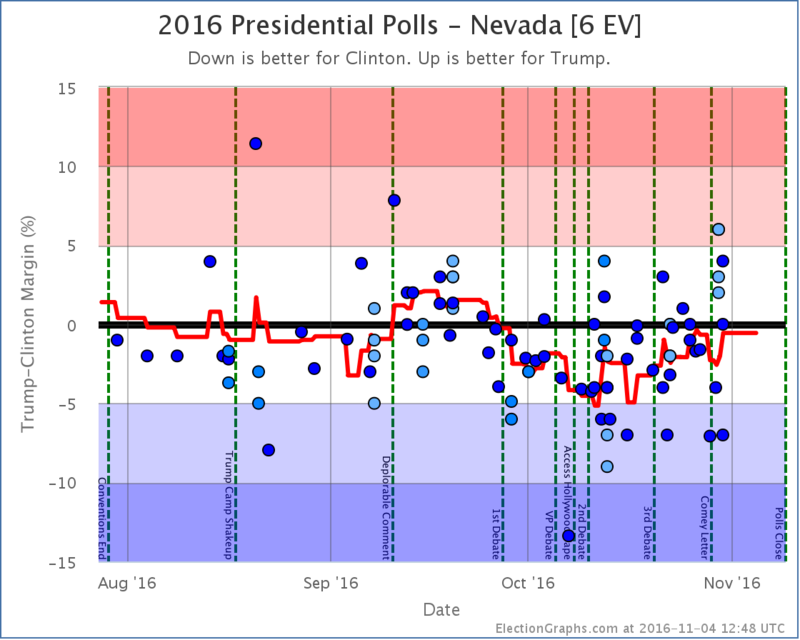 The additional Tuesday polls from Insight West didn’t change the status of Nevada (or any other state) after all. I’ll keep an eye out for new polls for about another hour, then I’ll lock things down and prepare to track (through a post, not changes to the main election graphs charts) the actual changes as the states get called through the night. 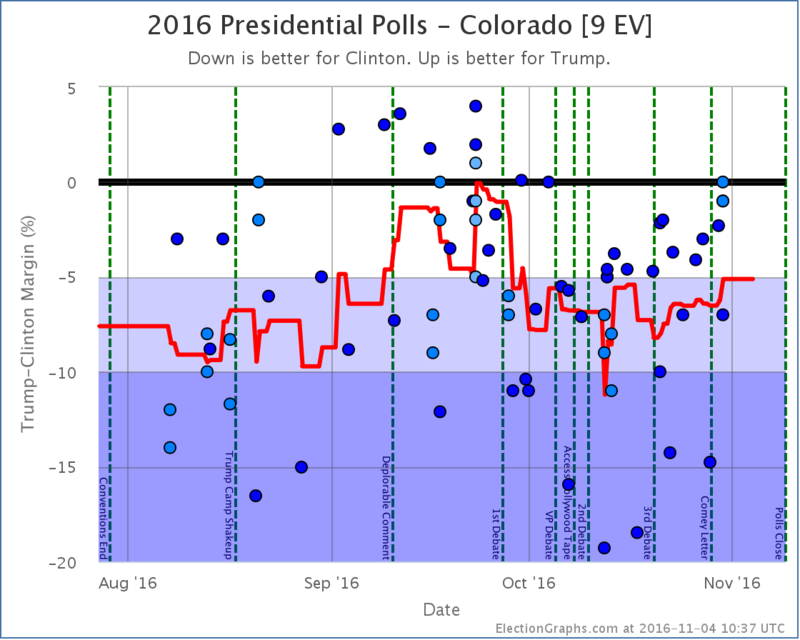 From the votecaster totals it looks like HRC is running quite well in the states they are monitoring. 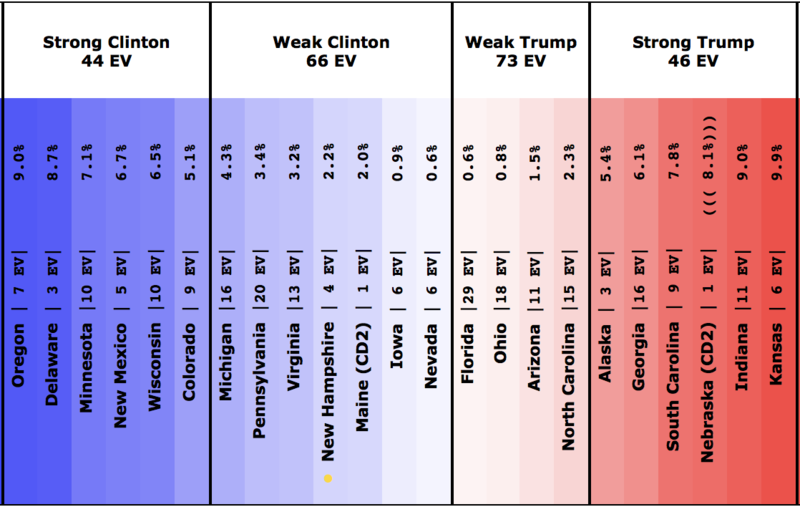 4 point leads in FL and PA and more in CO and WI. OH and IA look closer than expected, it may be that she takes OH and just loses IA. 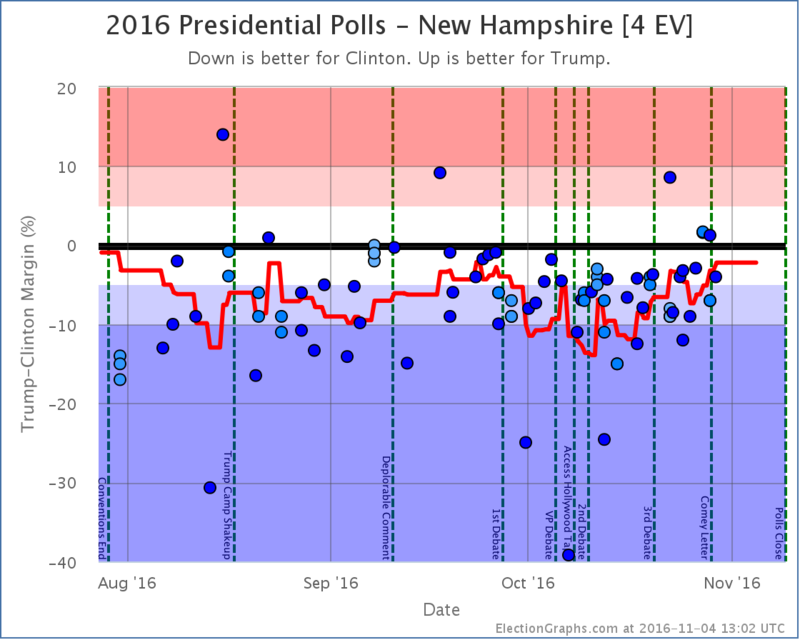 Best guess, from their data, is that HRC is running a couple points ahead of polls maybe a touch more in some places. 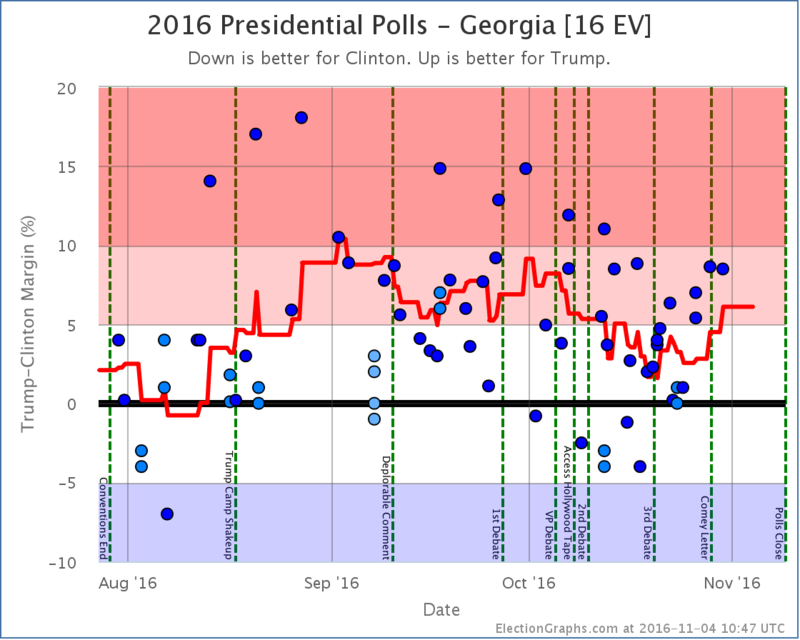 Certainly enough to have a shot at all the Weak Trump states, even though the GA may prove a bridge too far in the end it looks plausible that the results could be closer to Clinton best case if this is replicated nationwide.